Here at Casco Bay Lines, we try to keep our social media feeds filled with great photos of our favorite things, even in the dead of winter. So, how do we get our hands on such spectacular pictures? The answer is: from a lot of different places. It should come as no surprise – our deckhands and staff are multi-talented. Not only are they great at making our fleet run like a well-oiled machine, but a few of them have got a serious eye for photography. Whether it’s a photo of a gorgeous sunrise or a cool video of the snow at the terminal, those guys and gals are snapping great photos left and right. But, we can’t do everything on our own! We could not maintain the stream of gorgeous photos without the help of our followers. 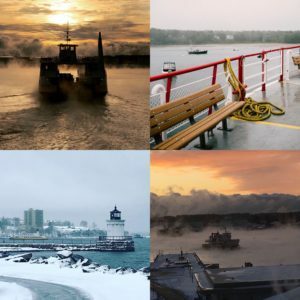 Some of you are regulars on the ferry—up with the dawn to catch that perfect shot of sea smoke as the Machigonne splashes through the water on your way to work—and some of you are just visiting—experiencing the beauty of Casco Bay for the first (or hundredth time). Whichever category you fall into, thank you, and keep those photos coming! 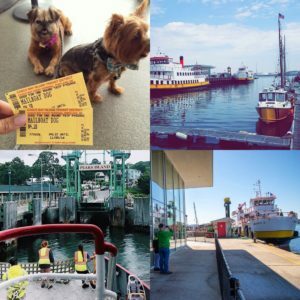 Make sure to tag us in your Facebook (Casco Bay Lines) or Instagram (@cascobaylines) posts. We love seeing your view of Casco Bay and sharing your photos with our followers. We’ll always ask your permission before we share, and make sure to give you props. Now, channel your inner Annie Leibovitz or Ansel Adams and find the perfect shot—we’ll be watching our feed in anticipation! Our staff is multi-talented! Two of these shots came from CBL staffers! Clockwise: our own @chuter82, @aurorahooper, CBL General Manager Hank Berg, and @jaysendodge. We love getting tagged in your photos! We keep an eye on our Facebook and Instagram mentions, and love to share your photos when we can! Clockwise: @bentleyandmeatball, @mzvandal, @coreytempleton, and @takeapeak52.